1) All that matters is mission performance and career durability. Strength and conditioning programming is meaningless if this training does not improve our athletes’ mission performance and durability. This hard truth is liberating, and means we are not wedded to one programming theory or approach, one set of exercises, etc. We are constantly testing, and evolving our programing a we learn and improve. 2) Keep it Simple, Focused, Efficient & Effective. Over a decade of mountain and tactical programming, we’ve learned that sophisticated design is immature. We’ve learned to improved our programming not by adding, but by subtracting – different methodologies, exercises, approaches. Our program design ethic is rooted in simple, clean, efficient and effective design. 3) The closer to the mission, the more “mission-specific” your training should be. To reach your potential for a mission or event, you must train specifically for the demands of that mission/event. 4) Programming must be programmed and periodized. We are uncomfortable with random training. We like to know where we are going. All of our cycles and individual training session have specific training goals are designed with this focus. 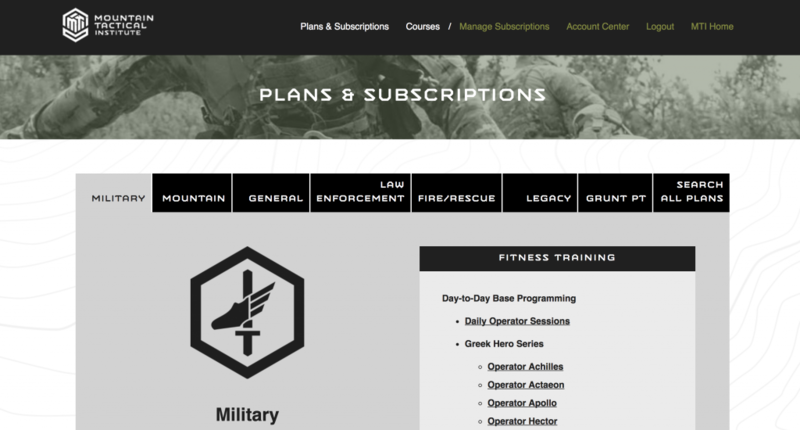 You have access to over 200 individual training plans as well as daily training sessions for Military and Law Enforcement athletes. Where to start depends primarily on how far out you are from a mission/season or event. If you’re close to a mission/selection/PFT/mountain sports season, etc., you want to complete one of our mission/sport specific training plans. If you are far from a specific mission/event, or you’re not training for anything in particular, you have several options. If you’re a military, LE athlete, we recommend you start at the beginning of the most recent cycle in the daily training sessions. Not training for anything specific and/or you have a fitness attribute you want to improve? We have multiple training plans focused on improving specific fitness attributes including injury recovery, strength, endurance, chassis integrity/core, etc. Many of these focused training plans are found under our “General Fitness” plan category. Where do I find the plans/daily training? From the MTI homepage, click the LOGIN button at the top right of the toolbar. From here you can access all of the training plans and daily training which comes with an Athlete’s Subscription, as well as all of the training plans you may have purchased which do not come with a subscription. Okay – I’m in the plan and see the training sessions. Now …. You round through the squats, push ups, sit ups and instep strength four times, or four “rounds”…. 10x squats, 10x push ups, 10x sit ups, instep stretch, then repeat 3 more times. How fast through I work through the circuits in the training plan? Unless prescribed as a work capacity “rounds for time,” As Many Rounds As Possible, interval or density event, work briskly, not frantically. Nearly all of our warm ups and all of our strength circuits include a stretch or mobility exercise like the example above. The stretch or mobility exercise is designed to be your “working rest” between rounds. Complete the stretches for 45-60 seconds, then move on to the next round. In the strength circuits, what does “increase load each round until 5x is hard but doable”? mean? What if I can’t managed the prescribed loading for the Work Capacity Circuits? The loading prescribed in the plan is for experienced, fit athletes. If it is obviously too heavy for you, “scale” the loading down. The goal for these work capacity circuits is to get all the reps in the rounds “unbroken” – it should be hard to do so, but ideally you’ll be able to get all the reps in. Load yourself accordingly. Why are there two loads listed listed for some exercises? The lower load is the prescribed weight for women, and the higher is for men. For example, 5x Back Squat @ 75/95# means women use 75 pounds and men use 95 pounds. Why are there two numbers listed for the exercises with assigned loads? The lower rep count is for women, the higher rep count for men. For example, 3/6x Pull Ups means women do 3x pull ups and men do 6x pull ups. Some exercise loads are listed in kilograms and some exercises call for kettlebells. What if I don’t have access to kettlebells? We have an extensive exercise instruction page, including videos, on the drop-down menu under the navigation bar “Fitness” category. Click Here. What if I have more training Questions or can’t find something? – click the search bar and type. – Spend some time reading our Q&A posts. – Email me! rob@mtntactical.com I answer dozens of athlete questions weekly and in general am very responsive. What if I have an Admin question – ie. billing, subscription issue, etc?